I finally made it round to The Boozy Cow in Aberdeen last night. It’s been open for a while but I’d heard mixed reports, so wanted to give it time to settle into a stride before trying it out. You know what? Ignore the haters. It’s great. OK, so the place isn’t cheap. Especially if you want some sides and a beer as well with your burger, but this isn’t McDonalds. If you want a pound saver menu look elsewhere. Also those sides, £3 for a bowl of coleslaw which I only needed a quarter of. Why not do a smaller bowl for £1? The skinny fries aren’t anything special either. The burger is the star of the show. Handmade, soft and juicy (the menu and waitress both advised it’s cooked pink, though mine was a little over) in a plump brioche bun. I went for the green chilli burger with cheese, jalapeno butter, pickle, lettuce and mustard. Honestly it was one of the best burgers I’ve had in a very long time. Beer selection is OK. Would like a bit more variety but what they have is good. A Vedett Extra Blonde lager and an excellent american style pale ale from FourPure are the standouts. If you want a cheap, fast food burger go seek out the golden arches. 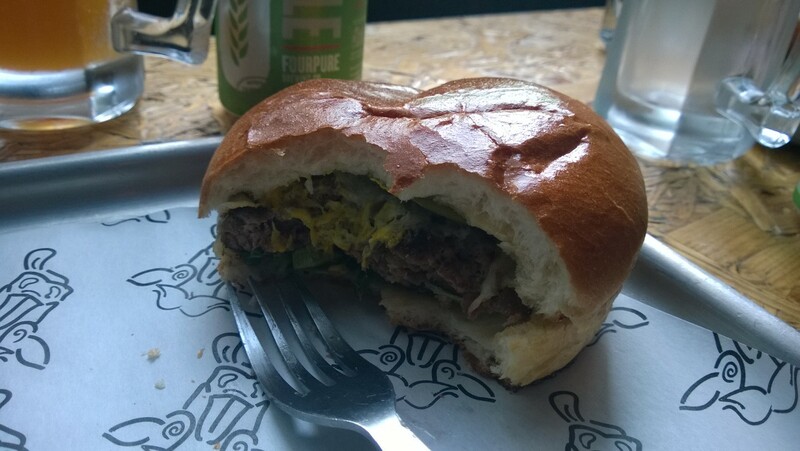 If you’re after an on-trend bit of beef in a bun with a bit imagination and some good beer to drink alongside it then check out the Boozy Cow.